Ag Commissioner Says Consumers "Screwed"
The Texas Department of Agriculture is supposed to ensure consumers aren't getting ripped off by fuel pumps, retail scanners or other measuring devices. But the agency is so cash-strapped that consumers are getting "screwed" due to a lack of oversight, the agency's new commissioner says. 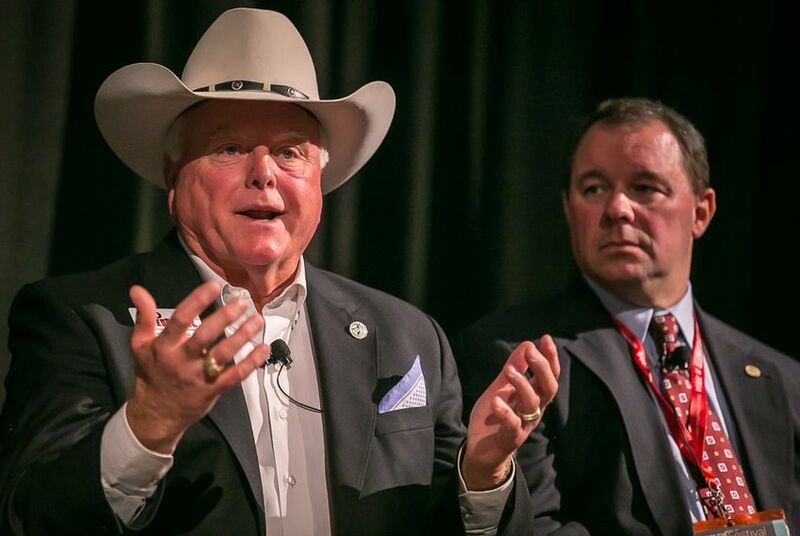 Texas consumers are “getting screwed” by unscrupulous businesses — everything from gas stations to pawn shops — because the cash-strapped Department of Agriculture has not been able to perform many of its basic regulatory functions, according to new Agriculture Commissioner Sid Miller. The department is supposed to check gas pumps for accuracy, verify that grocery store scanners work properly, attest that precious metal scales are producing accurate measures and even inspect taxicab meters to verify that people aren’t being overcharged. But after the department saw its budget cut by about one-third in 2011, Miller said, it has struggled to keep up with its duties. He noted that the department will collect an estimated $7.8 million less in fees and income from self-supporting programs than hoped in the 2014 and 2015 fiscal years, and faces a huge backlog of work left over from his predecessor. For example, there are nearly 2,000 cases involving suspected violations that haven’t been reviewed going back two years, according to department figures. Some $1.5 million in penalties that have been assessed has gone uncollected. And the agency has never once in its history inspected a taxicab meter, Miller said. Miller is asking the Legislature for nearly $50 million to restore the agency to pre-2011 levels, and says he will have to raise fees and licensing charges for a variety of programs the department oversees. In addition, Miller said he was concerned enough about the $7.8 million “lapse” in revenue in the budget adopted in 2013 — and other problems he has encountered since taking office — that he asked the Texas State Auditor’s Office to conduct a formal review of the agency. He said he is not interested in “pointing fingers,” but Miller wants to know in detail what occurred before he took office in January. Former Agriculture Commissioner Todd Staples, who left office late last year to become president of the Texas Oil and Gas Association after an unsuccessful run for lieutenant governor, said he was proud of his service over the previous eight years. Miller and Staples are both Republicans. "TDA is a very big agency with the broadest mission of any agency in the state. And there will always be some area that needs to be addressed. I hope Commissioner Miller can get his arms around how big and broad and complex the agency is," Staples said. “The TDA team consistently came in under budget, and resulted in returning about $50 million back to the taxpayer” during his eight years as head of the agency. That's about the same amount of money Miller now says he needs to perform core functions. As such, his comments clash with the narrative that Republican leaders have been crafting for years — that state government can and should operate on less money without compromising its duties to taxpayers. Former Gov. Rick Perry presided over deep budget cuts in 2003 and 2011, and newly elected Gov. Greg Abbott is asking most state agencies to cut their budgets by 3 percent over the next two years. Miller, who considers himself a fiscal hawk and campaigned as one when he was in the state House of Representatives, says he needs more resources to protect consumers from “unscrupulous actors” and fulfill the mission the Legislature has given him. Miller has briefed legislators about his concerns, and some lawmakers expressed shock about the state of the agency as he described it. State Sen. Paul Bettencourt, R-Houston, said he discovered the problems with the oversight of gasoline sales firsthand. “I learned about this when I drove my car in and filled up 27 gallons on a 19-gallon tank," Bettencourt said, referring to a gas station that he said had been deceiving drivers in Houston. "I commend the idea of getting out there, because the public is simply getting ripped off and they have no way of knowing it." Bettencourt said he doubted pawnshops were being honest with consumers, either. "I can only imagine the stir you will cause when you show up at a pawnshop" to look at weights and measures, he said. Miller is asking for an additional $48 million in funding from the Legislature. He said he wants the agency's huge budget cuts from 2011 restored. In 2011, facing an estimated $27 billion shortfall, the Legislature deeply slashed state agency spending. Lawmakers also asked the agriculture department to shift its marketing programs — designed to promote Texas agricultural products — to a "cost recovery" mode. Under that approach, programs have to pay for themselves with the revenue they generate through fees, permits and the like. In one such program, producers paid a fee so they could brand their products as "Go Texan" and the state would market the brand. When that became a "cost recovery" program, though, the department never raised enough money through fees to pay for it. That contributed to a reduction of almost $8 million in spending authority in the department’s current budget. As a result, Miller says he now faces the unpleasant task of raising various fees the agency collects in order to generate enough revenue to pay for the cost recovery programs at the agency. “I have the job of going in and tell everybody I've got to raise their fees and their licenses," Miller said. "People are going to scream at me, but we’re going to do it because that’s what the law says we do." Staples said much of the problem can be associated with the agency's failure to collect enough revenue from its marketing efforts. He said he never agreed with the Legislature's decision to make marketing programs recover their costs. "We recognize the dollars we were authorized to recover could never be achieved," he said. "[Marketing by the state] is not something that businesses want to pay for." According to the state comptroller’s office, which prepares revenue estimates and monitors agency spending, the agriculture department had a role in determining the amount of revenue it would collect from its cost recovery programs but never had access to $7.8 million of it for fiscal years 2014 and 2015. If an agency isn't collecting projected revenue, the comptroller "lapses," or withholds, the spending authority for the corresponding amount. “They never really had the ability to spend that money until we unlapsed it, but that scenario never played out, so it just remained lapsed,” said Lauren Willis, a spokeswoman at the comptroller’s office. “There is input from the agency to determine what the projections are for the estimate."